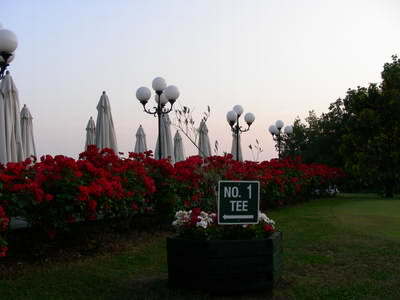 "There are some stunning Lake Garda golf courses to try out here"
Lake Garda golf is a great sport to do here. The rolling hills around the lower part of the lake are perfect for golfing, and many golf courses overlook the lake giving breathtaking views! There are a number of great golf courses around the lake; please see below for details of a few of them to give you an idea of what to expect. Take a look at some of the best Lake Garda golf clubs (please note pictures do not necessarily relate to the golf club referred to in the adjacent text, but may be of other Lake Garda courses). Arzaga I: Designed by Jack Nicklaus II, this hilly 18-hole course is laid out between Lake Garda and the Alps and carved through woodland with quite a few water hazards. The views are stunning with superb holes that all golfers will love. 18 holes. Par 72. 6992 yards. Parkland. Arzaga II: Designed by Gary Player, This 9-hole course is similar in lay-out to its sister course, but more hilly. 9 holes. Par 36. 3310 yards. Links. Facilities: putting and pitching greens, driving range, pro shop, equipment & golf car hire, changing rooms, bar, restaurant, babysitting, wellness center, swimming pool, tennis. How to get there: Take Highway Milano-Venezia, exit at Desenzano. Look for 'Palazzo Arzaga'. 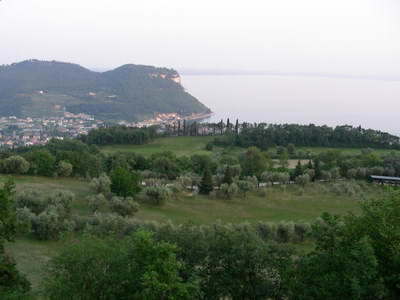 This golf course is near Garda, up in the hills overlooking the lake..so it has some great views! 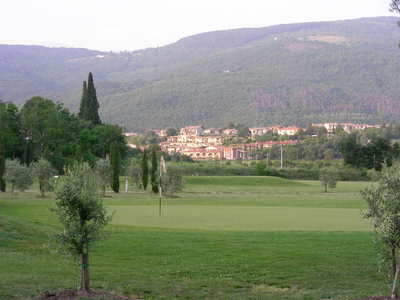 There are many Olive trees alongside the course, which may be what the club owes its name to. It is quite hilly with a number of water hazards to give a bit of a challenge. Holes: 18 holes championship, 9 holes executive. Facilities: training camp, putting-green, swimming pool, tennis, squash, fitness, sauna, bar, restaurant. How to get there: From Highway Verona-Brennero, exit at Affi (10 km); From Highway Milano-Venezia, exit at Peschiera (20 km). Designed by British Architects, many say that this 27-hole course is one of the best built in the last 10 years. It winds through the Valtenesi hills, amoungst cypresses, olive groves, centenarian oaks and maritime pines. It has amazing views and a wonderful clubhouse. Facilities: Clubs and golf car hire, Driving range, Swimming pool, Pro-shop, Bar, Restaurant, Tennis. How to get there: Highway Milano-Venezia, exit on Desenzano in the direction of Salò. After Moniga, in Manerba, turn left: after 1 km you will reach Gardagolf. This golf course is beautiful, and is covered with oleander, laurel, cypresses, olive trees and other plants typical of Mediterranean vegetation. There is a wonderful view over almost the full length of Lake Garda and the surrounding mountains. Facilites: Pro shop, driving range, putting and pitching greens, equipment hire, swimming pool, bar, restaurant. 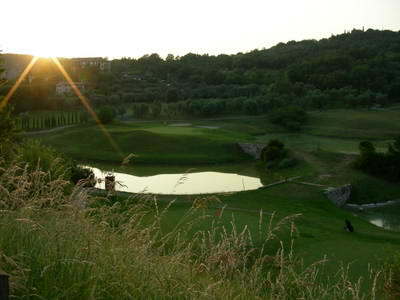 How to get there: Golf Bogliaco is just off the main road beween Toscolano Maderno and Gargnano. This course was designed by Jim Fazio, a well known American architect. 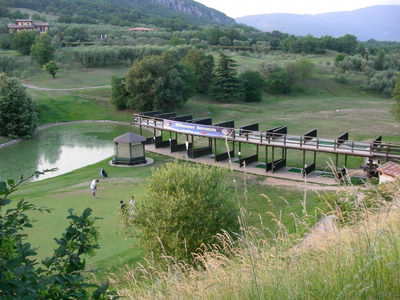 Once a vineyard, the course is set in rolling hills overlooking Lake Garda, with Monte Baldo as a backdrop, giving the perfect golfing atmosphere. There are a few water hazards too, making it both a bit challenging and beautiful. Facilities: Putting, pitching and chipping green, driving range, bar, pro shop, wellness center. How to get there: from Highway Milano-Venezia exit on Peschiera, in the direction of Valeggio sul Mincio. The club is after 1 km on the left. Another good option to consider is to stay at a hotel that has a golf course in its' grounds. This way you can easily play loads of times and you don't have to worry about getting there! This is probably the ultimate way to go for the golf lover. One such hotel which offers this is the hotel Veronello at Bardolino.